Adam J Purcell logs his travels to LUGRadio Live 2007 on the 7th of July. I've just about recovered from the madness of the third LUGRadio Live event. A good event, as ever, though this time I only went up for the Saturday and missed out on the second day. 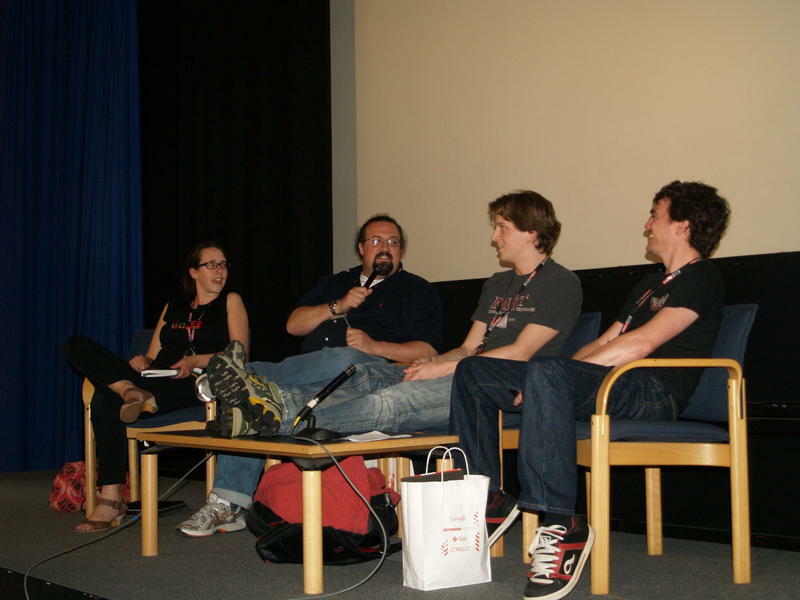 Still, the Saturday was exhausting enough (and it matches the length of the first LUGRadio in 2005 - a fantastic one day event back then). A 5AM wake up and out of the house by 5:40, then the 3 hour drive to Wolverhampton. I actually made even better time than that - it was the perfect journey, no traffic congestion, no adverse weather, just plain sailing! A borrowed sat-nav got me directly to the Light House and the big LUGRadio Live banner confirmed the sat-nav hadn't led me astray. Fortunately the long-stay car park was on the opposite side of the road and £4.50 later I was parking up and looking at the clock on my dashboard - 08:23. Hmm, 10:00 doors open, 10:30 for the beginnings of the event itself. Hmm. Nothing for it - I decided to take the very short walk toward the town centre to find some breakfast. Obviously it was rather early and not much was open. I did find my way to the large mall and went to locate the food court. That's when I got the idea of locating a Baskin-Robbins for a large chocolate milkshake. Nothing like that in this mall, sadly. So I went further afield. No sign of much life or any ice cream places. In the end I pulled out my handheld GPS (a different device to the car sat-nav that I had borrowed) to find my way back to my car. Getting back I decided to eat the lunch I had packed for myself as breakfast instead! Got back to the Light House (no, it's not really a light house, it does have a little tower that presumably inspired the name!) at about 09:45 and hung around with the other attendees congregating outside the venue. That's three years in a row now that there's been nothing to do but hang around until the opening (though last year at least we were able to queue inside, the first and third years we've just amassed outside). It would certainly be nice to have somewhere we could grab a drink and a seat as we wait. Probably not many venues that can offer that, though. The doors opened on time and in we rushed! The Light House was, on the whole, a very nice venue. The main Atrium area was very good sized and had a nice glass roof. That's where one of the two major stages were, the other being a large cinema room off the Atrium. Somewhere else, that I didn't actually go to find in the end, there were rooms for the Lightning Talks and BOF Sessions. At the back of the Atrium were the Exhibitor stands. That's where I found the loud mouthed Nik Butler manning the Ubuntu stand, giving away Ubuntu CDs and trying to push polo shirts for £15! This year I was on a very strict spending limit, after all the recent podcasting sound hardware and this nice new red laptop I'm writing this on now. I had £10 of cash in my wallet and a promise to myself not to use any of my far too numerous plastic cards. Sorry, O'Reilly, no stack of cheap books for me this year (and therefore no free O'Reilly t-shirt, either, unlike the previous two LUGRadio Lives - still I had two free Red Hat t-shirts and I didn't need to buy any books to get those!) Over lunch I tracked down Matthew Bloch on the Bytemark stand (Bytemark being the people who I rent the VM that hosts Staggering Stories, including this blog, from) and quizzed him about the upcoming improvements to my Virtual Machine - the RAM is going up from 80MB to 150MB (doesn't sound much but is surprisingly healthy for a Linux machine running little more than Apache and PHP) and hard disk storage up from 4GB to a mighty 10GB (that will hold a lot of podcasts!) He said he'd hope for the upgrade sometime in the coming week. I won't hold him to it - I know how busy those chaps are. Besides, that will mean me rebooting my VM and with an uptime of 319 days I'm not really in a hurry to do that! Incidentally, I should note that I signed up with Bytemark after attending a talk Matthew Bloch did at last years LUGRadio on VMs. It clearly does pay to advertise! Back to the actual LUGRadioness of it, though. As per tradition, the LUGRadio team gathered, late, to open ceremonies with a quick introduction. The past two years it had been Jono, Matt, Aq and Ade but a mere few weeks ago Matt stepped down and Adam Sweet took his place on the team. It was a bit strange not seeing Matt there but Adam was hardly a stranger after having a large presence at both prior events. Matt did eventually show up in the crowd later in the day, in much the same way I remember Sparkes (who Ade replaced a few months before the first LUGRadio Live) did in the first year. It was a morning of comfort as I didn't have to move at all to see the talk from the world famous Alan Cox (once thought of by many as Linus Torvalds' second in command, before Alan withdrew a little to do some academic work). He spoke about... Erm... I can't really remember! I think it was a general terms overview of how Open Source development takes place and generally urging everyone to take part. We don't all need to be programmers. People who can write documentation, proof read, translate, consistency check, perform marketing and advocacy tasks, even people who just help support other users are all much needed. Jono had seen Alan give this talk at another conference and specifically asked him to do it again for the LUGRadio Live audience. One particularly interesting thing he mentioned is that, as a big driver developer, he saw the problem of Linux drivers diminishing very quickly. Apparently Microsoft driver policy on Vista (very expensive driver testing and certification forced by Microsoft) has seen a lot of manufacturers who would once have created their own custom hardware interfaces now move towards standards based hardware. If their hardware can use standard off the shelf drivers then they save themselves the expense of paying Microsoft for certification (not to mention the delay in time to market certification gives). That means, for Linux, that one driver can be written that supports many competing products. An example of that would be removable storage such as USB memory or USB hard disk drives. The same with keyboard and mice. Increasingly that's true of devices such as webcams, too. Bit of an own goal for Microsoft! He also mentioned that while some of the larger hardware manufacturers can be a little slow with Linux drivers (where requiredcontroversial) it is getting quite easy to get the smaller companies on board now. These smaller companies might have only a few percent of the Windows market but tell them they can have 100% of the Linux market (though, obviously smaller than Windows right now) and they see the immediate advantage of potentially millions of desktops their bigger rival is ignoring. That bigger rival will, of course, take notice in time as they see their own market share diminish. It's an interesting phenomenon that can only help Linux users into the future. 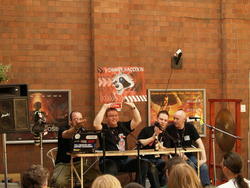 The first session of the afternoon on the Atrium Stage was the horror known as "Adam Sweet's Gong-a-Thong Light Bulb Talks". The stage had a large gong sitting on it ready. The Rocky theme tune started up and down the centre isle of the audience came a robed man jabbing at the air. To everyone's disgust when he got on stage he removed the robe to reveal he was wearing nothing but a thong. Several people in the audience gouged their own eyes out. The only thing that stopped me doing the same was to SEP it and just laugh at Adam Sweet's very obvious embarrassment. Many of us that could still see him laughed unsympathetically at his plight! He went on to ask the audience if any of them had ever had that nightmare where you find yourself naked in front of a huge crowd of strangers! Can't say I have but I can certainly understand (and laugh!) There will no doubt be a video of this (and all the other talks) coming out shortly. In years to come he will be able to look back at himself squirming on that stage and saying how it sounded like such a laugh when the idea of the thong was first proposed to him! But enough of this schadenfreude. The idea of the Light Bulb talk was basically as a cut down Lightning Talk. Instead of half an hour on a subject you'd have with the Lightning Talks these Light Bulb talks would actually be more like three minutes. People, on the day, added their names to a list on the wall if they wanted to do a talk. 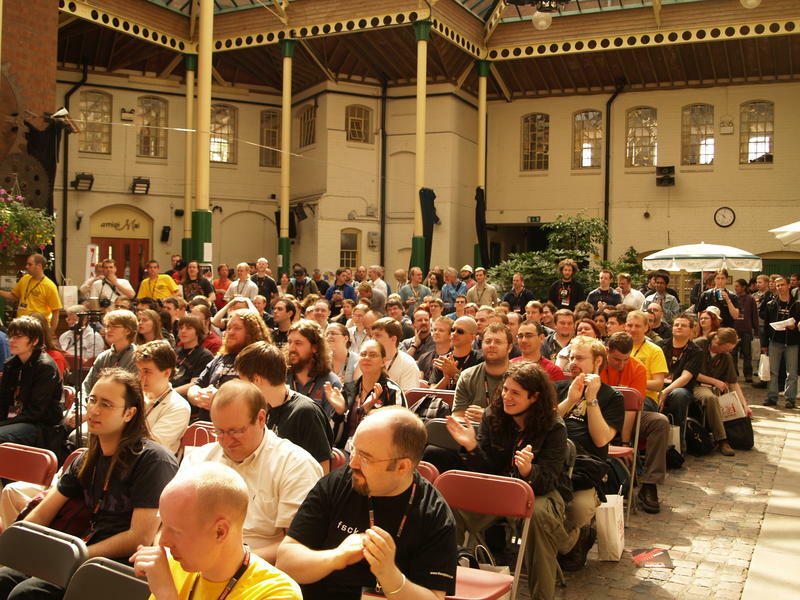 The list increased considerably when it was announced the talks would be judged and the winner would get a Nokia N800 Internet Tablet (running Linux, naturally). A very nice prize worth about £300. I'd very much like one but not quite enough to stand up on stage (even fully clothed) to win one. There must have been a good 15 or so speakers with their topics, who were sent off stage with a hitting of the gong by the selfconscious Mr Sweet. Some of the talks that stick in my mind include: The new Linkpot website/service which is described as "LinkPot works like TinyURL, producing short URLs that redirect to that lengthy link that you'll never remember, but unlike TinyURL the links are made up of real words, not random characters. This means it's easier for you to pass them on verbally, either over the phone or on your podcast." A very nice idea by 'MrBen', a major player in the LUGRadio community. We also had a chap from Indonesia looking for people to help out with IT infrastructure after the tsunami. The chap from GP2X who was basically trying to drum up interest in their Linux based handheld games console (a great device it is too). The winner of the N800 was someone who did a fantastically funny and well thought out sketch on the similarities of ordering food at a pub and networking protocols. A well deserved win, it's a shame he was gonged off after 3 minutes. Thankfully it was then away from the Atrium Stage and back onto the Main Stage (with the less uncomfortable chairs, the ability to be able to hear the speakers and without the sun beating down on my head) in the cinema room. It was time for the third ever 'Mass Debate'! This year Jono acted as MC to four guests: Becky Hogge from the Open Rights Group, Chris DiBona of Google, Nat Friedman of Novell and Steve Lamb from Microsoft (making a reappearance after he, just about, survived LUGRadio 2006!) Google's Open Source Programs Manager, Chris DiBona (yes, the LUGRadio team have taken the mick out of his surname in previous podcasts!) pretty much dominated this Mass Debate. He's an American but he made several references to being a Doctor Who fan, so we can forgive him that accident of birth. Like previous years it was a Question Time/Any Questions sort of format, where the audience ask questions of the panel (or particular people on it). Particularly fun were the comments between Microsoft's Steve Lamb and, mainly, the audience about the conflict between the Open Document Format (used by the likes of OpenOffice, KOffice and is a ratified open standard) and the Microsoft Office OpenXML (which they are attempting to steamroller through the standards process). Steve Lamb admitted to not having read the specification for Microsoft's OOXML format and which point some wag in the audience shouted out something to the effect of "no one has - because it's 5000 f**king pages long!" to which everyone (except Steve) burst into laughter! Another hot topic was the BBC iPlayer. This is the Internet service the BBC are trialling right now as a way to catch up on TV by downloading programmes to your computer. Naturally the controversial bits of this are the Digital Rights Management (you have to watch it within a month and it disappears from your computer 7 days after you do watch it) and, more immediately to us Linux users, it's Microsoft XP only. Yes, I said XP - it didn't even work on Vista at that time (I don't know if it does now or not). The panel didn't quite come to a consensus on if this broke the BBC charter of making programming available to all TV Licence fee payers (they still had the old fashioned option of watching/recording via live RF broadcast feeds). Becky Hogge of the Open Rights Group did hint that a lot of legal work was happening in the background on this one and a favourable outcome was likely, eventually. The BBC cannot be seen to force users to use one companies products - they can't force people to use Sony TVs, for example. A few days after LUGRadio there were public rumours of the BBC Trust looking into this issue again. All in all, this was a good Mass Debate, yet again! That led directly into Chris DiBona's own talk about open source in Google. That is, it would have been directly into it if some inconsiderate sod hadn't held things up by about 10 minutes by do an impromptu video interview up close and personal with the four speakers from the Mass Debate. He's lucky he wasn't pelted with rotten fruit by the end there - by all means do your interviews but don't hold everyone up for 10 minutes while you monopolise an entire room. Wouldn't have been so bad if the audience could actually hear any of it. Anyway, Chris eventually managed to get to start his talk. Not many people realise that if you've ever used Google, then you've used Linux. Google has a very clever infrastructure based on cheap PC components as massively clustered Linux servers. Chris explained how early start up frugality (it's a real word!) has shaped them into using very cheap standard PC parts where most enterprises would spent huge amounts on high end hardware redundancy kit (two PSUs, in case the primary fails, striped SCSI disk arrays, etc). They put all their redundancy at the software level - if a server fails then another cheapo server (or probably servers) will pick up the load. Of course they also take standard Open Source software, such as the Linux kernel and MySQL, and tune/customise that for their unique environment. As a thankyou to the Open Source world they pour back a huge amount of work into Open Source projects, either directly as code or as grants. In the past few years Google has created the 'Summer of Code' project. Part of Chris' duties is to oversee this project. It basically entails Google paying university students to work on specific Open Source projects over their summer holidays. Projects submit a proposal to Google for a specific new feature or task that they want to student to perform. Google (i.e. Chris and a couple of his colleagues) go through these and pick out the best ones (not in any way based on advantage to Google - they've got their own programmers for that kind of thing). Google then work with universities to choose some promising students and dole out the work. At half way through the task the student's work is assessed by the project people they are working with and, if all is well, they get half their money. Then there is a final assessment at the end to see how they've done and if they've earned their bounty. It's a great scheme and it's expanding every year. It gets these students into Open Source projects, which is good for everyone, it makes Google look good and it keeps a few students out of mindless summer work and using their real skills. Google should certainly be applauded. Hopefully others (governments?) might follow suit some day. The final event of the day (I didn't hang around for that evenings disco..!) 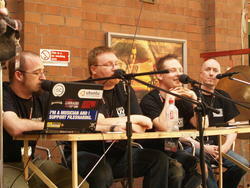 was this years LUGRadio Live and Unleashed. This is a live recording of a LUGRadio episode in front of an audience. It was back to the Atrium Stage, sadly. Nothing else was scheduled against this, there was nothing happening on the Main Stage, the Lightning Stage or the BOF point. Therefore there was a lot more people wanting to watch it than there were chairs! From what I gather it was even more difficult to hear what was being said from the sides of the room where the people were standing as an overflow to the seats. Fortunately I had anticipated this and was sure to get a swift exit from Chis DiBona's talk to grab a fairly central chair (though not right next to the centre isle, as in previous years the LUGRadio team had, rather unsuccessfully, attempted to force random audience members into participating!) As has become customary, these live LUGRadio episodes tend to be little more than a prize giving ceremony. As someone who has not ever had any real hand in organising the event, not really involved in the 'LUGRadio community and not traveled a great distance to be there (though it feels that way when driving for 6 hours in one day!) then I have zero chance of ever winning a prize. 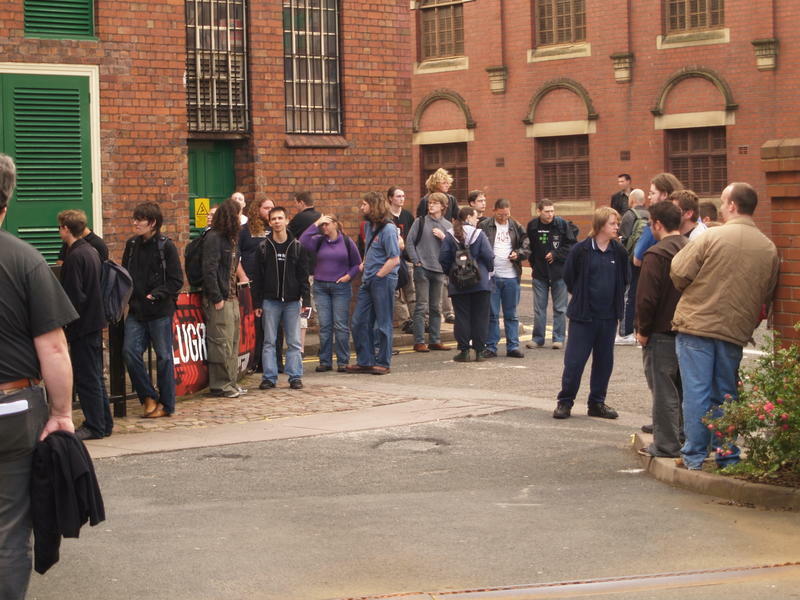 I know of at least one person who came along to LUGRadio Live 2006 who purposely didn't this year because he felt the event was too cliquey. I'm afraid he has a point. If you are not part of the 'in crowd' at LUGRadio it is a very different event than if you are. This has gotten worse over the years. The first year it was a more open event, or so it felt at the time. Everyone was talking to everyone. 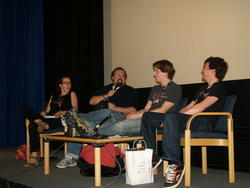 You could just go up to the LUGRadio team and have a quick chat (though they were exceptionally busy that year!). It's a shame that has changed. 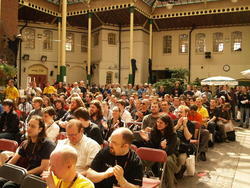 As it's become more organised it's getting away from the more open and approachable event. It's no fun to see that so blatantly played out than sitting through half an hour of the same faces get prizes every year. Yes, they all deserve recognition for their hard work on making LUGRadio Live happen but can't this be done in the closing ceremony rather than as the major chunk of Live and Unleashed? When you are sitting at home listening to a regular LUGRadio you feel a part of it. When your sitting there in the audience of Live and Unleashed you feel excluded, forgotten. It's not rational but that's just the way it is. So, that was LUGRadio Live 2007, for me. Still a good event but, I'm afraid, I don't think it was quite as good as last year and certainly not as welcoming as the first year. The guests and topics didn't quite grab me as much as previous years, either. That may say more about me than the event, though, I'm not sure. Another announcement, that I forgot to mention, during Live and Unleashed was that there would a LUGRadio Live USA next year (in addition to the UK one). Google will be pushing a load of cash into that (plane tickets for the LUGRadio team and the like, I assume). Likely to be based around Silicon Valley, possibly on or near the famous Google campus. It's a tempting thought - I could make a real holiday out of it. Not a holiday I want to do on my own, though, and if I can't persuade any of my friends to come up to Wolverhampton for the day then a trip to California is not too likely. 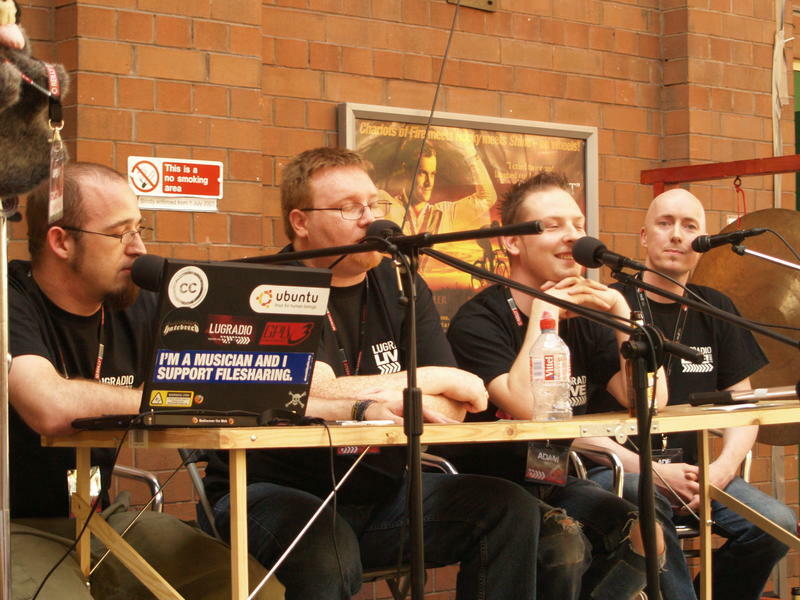 Still, I will almost certainly be attending at least one day of LUGRadio Live 2008, UK. It's still a great event and a bargain at a fiver, even if it might not be as great as previous years. Will 2008 see yet another different venue or have the LUGRadio team finally found one they are happy with..?! Time will tell! The photos above are all by 'Big RonW', more of his photos can be found at Big RonW's Flickr photos. Thanks to him for making his photos available with a Creative Commons Attribution Licence.